ABU DHABI, United Arab Emirates—R.I.S.—It only could be a fitting end for Lewis Hamilton as the Briton, already a five -time world champion, took the lead on lap 35 Sunday evening at the Abu Dhabi Grand Prix at the Yas Marina Circuit, concluding with a 2.5 second victory over Sebastian Vettel. Red Bull Racing’s Max Verstappen took third. Hamilton though in his best sportsmanship, praised not himself, but his Ferrari rival. Hamilton had no difficulties once he obtained the lead and cruised to the win following an early pit stop which put him down to fifth. But Hamilton moved up thanks to others pitting, and found himself in the lead, while others behind him fought for position. Hamilton did take the lead from the start, but just as the opening lap was finishing, Renault’s Nico Hulkenberg went on the outside of the American Haas F1 Team’s Romain Grosjean, and hit the Frenchman at turn nine, flipping his car end over end, finishing upside down near the barriers. 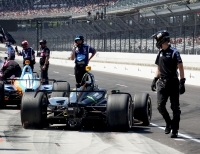 It took the marshals quick work to put out the small fire, as Hulkenberg could not get out of the car, due to the halo device blocking his escape route. Eventually, the German got out of the car, and was unhurt, enough to watch the rest of the race from the pits. Hulkenberg was the only retirement that did not have an engine problem. The rest of the retirements, Kimi Raikkonen, Marcus Ericsson, Esteban Ocon and Pierre Gasly all ended their evening with engine issues. 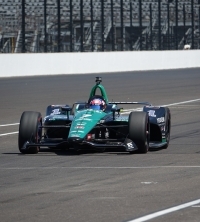 Rain did appear on the track by lap 23, along with the threat of thunderstorms, but the precipitation ceased only ten laps later, and was never really a threat for the drivers to change to intermediates. Daniel Ricciardo nearly missed out a podium place in his final drive with Red Bull, finishing fourth, while Valtteri Bottas had two times where he went off track, losing his position in his Mercedes to take fifth. Carlos Sainz, in his final drive for Renault, ended on a superb note finishing in sixth. Seventh went to Charles LeClerc in his last appearance for Sauber, while Sergio Perez finished in eighth. Grosjean took ninth, and for Haas, it was a double point finish as Kevin Magnussen completed the top ten. Fernando Alonso, in his final F1 race, finished in 11th, which will make many fans wondering if the Spaniard will ever return to this sport again. Hamilton took the championship lead following the Austrian Grand Prix, back in July and never relinquished it. And this is what Hamilton wanted from the start of the season and he reflected it afterwards Sunday evening.